First, if you invested good money for a new car why would you want to save a few dollars on oil to protect the most expensive repair item? I personally try to change every 6,000 miles and for the first 10-15,000 miles change the filter only at about 3,000. Just a hunch but I suspect the filter to be the weak link in this whole equation. Note, the '04 Impala I "inherited" from my wife just turned over 300,000 all original miles with no engine or transmission problems. Just for clarification to readers of this thread, the youtube video in post #7 is for an engine oil and filter change, different that the CVT fluid change. That was to answer pryna66's three part questions in post #6 of this thread. Last edited by redbull-1; 09-25-2014 at 06:04 AM. How about a picture picture of the filler hole? This is very much like my '07 manual trans, and I love it. Its easy to change its fluid. It is shown in my post #3.
your information has been very educational for me and right on point for newbie. I 'm convinced that i can complete the CVT transmission fluid Drain/ Fill. However i have question, you did mention that automatic transmission on the 2014 Honda Accord has capacity for 3.5 Liters, now the question i have is, would it be an issue if its not exact? would it cause a problem if i put in 4 quarts instead? i know sometimes with oil change there is wiggle room, just wanted to check with all before i land myself in a bill for transmission fix.....please provide insight. Follow the instructions in my post #3 regarding proper checking of fluid level and do not overfill the transmission. This is an image from that same post, it shows the relative amount of fluid for that would be between the upper level and proper level (i.e., about 0.1 L (0.1 U. S. quart). It is normal for the fluid to be between the upper level and proper level. Also, note that a liter is more in volume than a U.S. quart. 2. The fluid level check bolt, I opened it and fluid came out athen it driped and went to drops and then stopped, is that what should have happened? You do not have to wait till it stops; a slow drip is optimal. 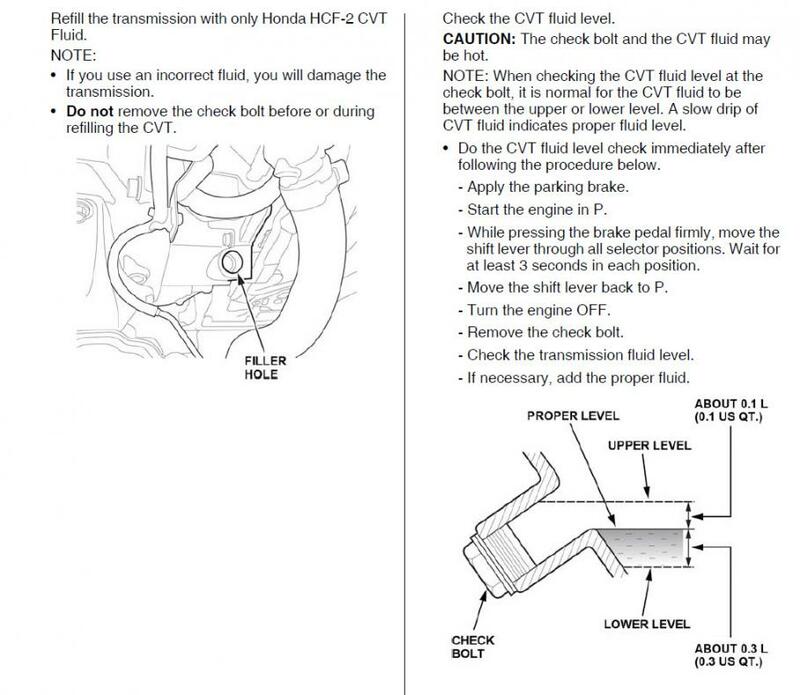 However, even though it stopped, if the vehicle was relatively level, the CVT fluid would still be at the "proper level" as shown in the instructions. In other words, probably no need to worry about it. Happy Holidays. what was wrong with your cvt that they replaced it?